MiG-down is west of F-16 downing point. 7km west of LOC. 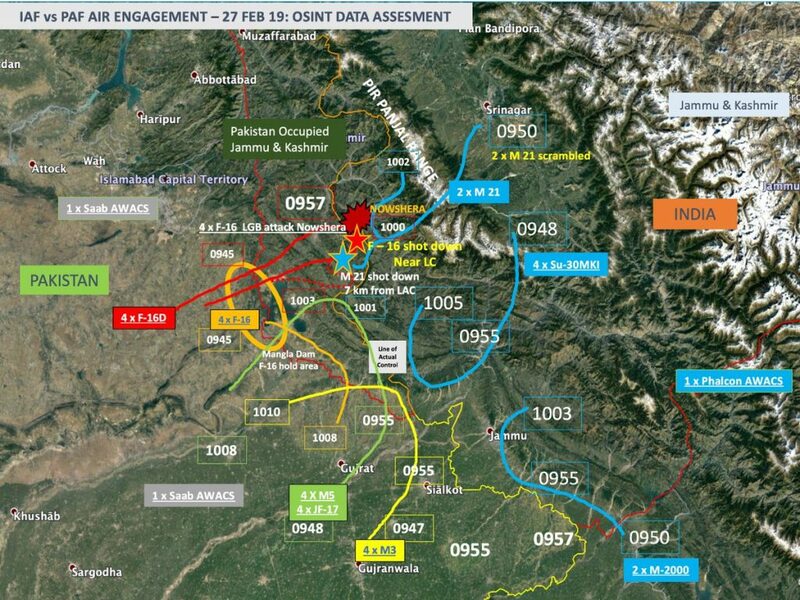 Abhi was pretty equidistant from all 3 F16s? Wait which F16 did he shoot? The ones at 40k or the one at 15k? There is a 4 ship and a 2 ship F16 formation. Which one became the 3 ship formation we see in the radar grab? Do pentagon/LM officials go around like Bangalore RTO cops and check chassis numbers below the windscreen? What kind of a crap job it that? Wait, then do they do the same for all Amreki eqpt with IAF as well? Unseen Feb27 upload from "Azad Kashmir" some kid. Can't make out much. Can anyone read the title slide caption in Urdu AJK mein PAF ne India ka shikar kaise kiya - asli video. Thank you. Could see 3 different contrails... Doenst mean anything though. I suspect this video is already seen? Unseen Feb27 upload from "Azad Kashmir" some kid. He is surrounded by PA jawans. One can think locals might mistake own guy. Jawans mostly won't. And the pilot died - this guy looks fine. This tweet gives indication of Brahmos strike on Al Bakistan on 5/6 March . Any chaiwala input on this third strike ? FYI the Bison loss at Bikaner - Pilot landing video. Note: Canopy of the chute looks Orange and greenish from afar, and white from up close? 1. Are there 2 parachutes? 2. At the end the videomaker says "chattri India ki lag rahi hai"
kindly peruse through this video https://youtu.be/lpg0ULKQQQs W/C Shahbaz Haider of No 19 Sherdils Squadron. PAF F-16 pilot. As per the disreputable site you may have visited: A few years ago, he received the best Combat Commander trophy at the Graduation Ceremony of Combat Commanders School (CCS). manjgu wrote: i beleive anybody who maintains Mig 21 or F16 can easily tell from the engine pic as to the real identity?? nam wrote: We need to geolocate this place. I have a feeling this is a different place. This is parachute canopy from MB ejection seats. Guess which aircraft has MB seats and which doesn't. Can anyone link to videos where eyewitness said Parachutists had Indian flags? Can anyone who has registered online as a business visitor comment how the registration process was? Does one have to register separately for each day of visit? Really unfortunate to see fellow BRFites pedaling debunked conspiracies. Please keep to topic. Aditya_V wrote: That too a guy who got in through a special Quota. An Elder Kaniya Kumar thats all.